They had to sit out a two hour lightning delay, but those that waited to see the exciting climax between Coldwater and Clinton-Massie went home believing that any thoughts about a Cavalier demise were premature. And how true he was. The young and largely overlooked Cavaliers scored four touchdowns by four different players, racked up 357 yards on just 46 plays, and witnessed the emergence of the next quarterback named Hemmelgarn – Jake – who coolly completed 17 of 24 attempts for 252 yards and three touchdowns (of 27, 23, and 10 yards). All that…and a 31-28 win over last year’s Division IV state runners-up that returned no fewer than nine starters at key positions on the field. It left the Falcons frustrated, winded, and in McSurley’s words, afterwards…”exposed”. Winners by a 77-7 margin over East Clinton High School last Friday, the Falcon faithful from Clarksville were left to make the two hour drive back to Clinton County with yet another postcard from ‘The MAC’. The plan was to try and slow down Massie’s powerful run game, featuring Brendan Lamb (22 carries for 144 yards), Daulton Wolf (10 carries for 47 yards), Tyler Beam (10 carries for 36 yards), and quarterback Corey Stulz, who added 13 carries and another 83 yards. 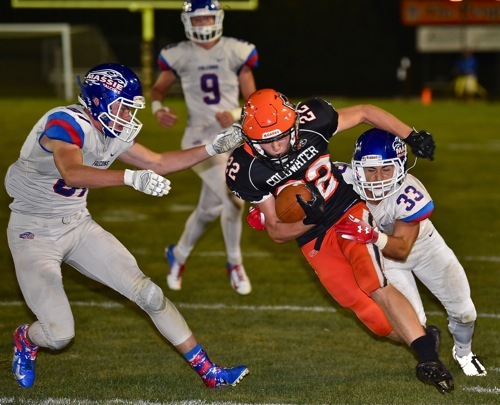 Coldwater never really got that done, however, as the Falcons racked up 343 yards on the ground. But the other half of the plan, on offense, was to probe over the top, to the flanks, and any way possible to get the football into the hands of those skilled position players that McSurley so feared. That part did work, as Jake Hemmelgarn was simply ‘aces’, finding willing hands repeatedly to extend drives and score, putting Massie in the position of playing catch-up all night long. Mitch Niekamp rumbles for a sizeable second quarter gain and a touchdown. They started early. 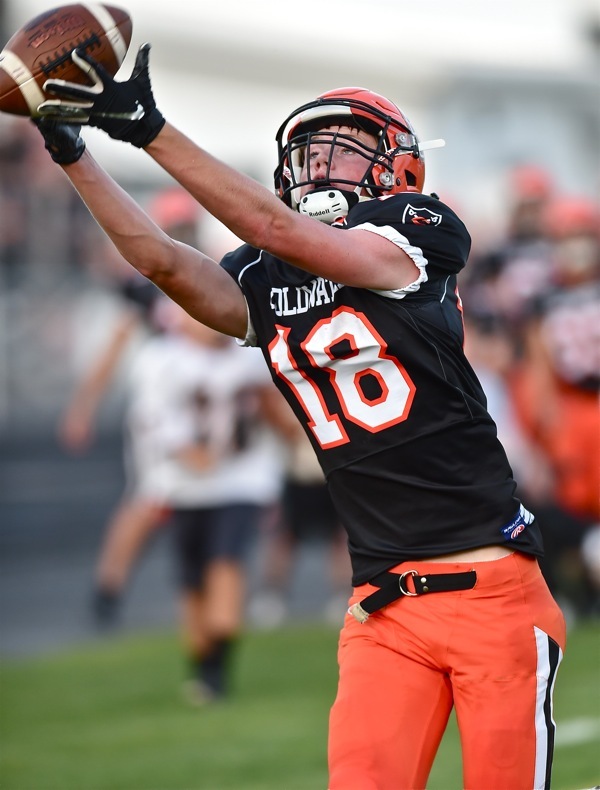 After a ten-play drive by Clinton-Massie that ended with a lost fumble on the Coldwater ten, Hemmelgarn went to work on an eleven-play drive that ended with a circus catch of a 27-yard strike by junior Will Broering. 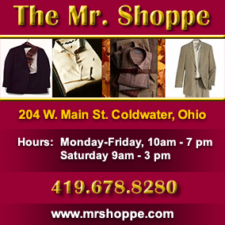 7-0, Coldwater. 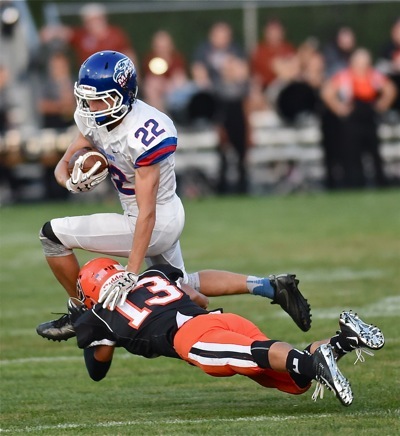 Massie answered five minutes later at 6:29 of the second quarter when Coldwater lost containment of Corey Stulz and the senior quarterback waltzed through the secondary for a 35-yard touchdown run. But if the Cavaliers are young and inexperienced, they didn’t act it. At 3:57 of the second Hemmelgarn came back to hook up with Cole Frilling in the corner of the end zone for a 23-yard touchdown to retake the lead and go to the halftime locker room with a 14-7 lead. They quickly tacked onto that lead on their first drive of the third quarter – a 14 yard run by Mitch Niekamp, weaving his way to the goal line where he just barely crossed, giving the Cavs now a 21-7 cushion. But that didn’t last because Massie’s Brendan Lamb scored on a 10-yard run at 2:12 of the quarter to cut the lead to 21-14. Coldwater’s Paul Buschur chops down Massie’s Garret Trampler on a first half Falcon run. And at that point the heat and humidity raised its ugly August high school football head. Lightning was spotted by the officials, and both teams were waved to the locker room for what turned out to be a delay longer than the game itself. In theory, the OHSAA and National Federation rule about lightning safety is a good thing, but in practice it was again poorly managed Friday. Not by the officials, mind you. They did their part by adhering to the letter of the law. But everyone in the ballpark had a smart phone with radar on it…and could clearly see that there wasn’t a cloud, rain, or lightning within a hundred miles of Coldwater, Ohio. And yet, they waited, and waited…much of the Coldwater crowed finally getting impatient (and sleepy) and leaving for home, bed, and the convenience of reading about it on Press Pros in the morning. And when they did come back to the field at 11:45, Coldwater had the ball on the Massie 17 yard line with fourth down and six yards to go for a first down. Enter now junior placekicker Blake Dippold, one of the state’s best, who promptly bucked the rising winds to drill a 34 yard field goal and extend the Cavalier lead to 24-14. And that kick loomed large, and immediately. Winners Meats are proud to sponsor coverage of the ‘MAC’ on Press Pros Magazine. On their next possession Massie drove 51 yards and Brendan Lamb slammed the ball across the goal line on a 7-yard run to cut the deficit to 24-21. And with four minutes remaining on the clock the Falcons attempted an unsuccessful onside kick to get the ball back. Coldwater and Jake Hemmelgarn had other ideas. With the wind now gusting Hemmelgarn took the ball at midfield and moved the Cavaliers down to the 10 yard line, aided immeasurably by a 20 yard catch and run by tailback Ben Wenning. Moments later, Hemmelgarn and junior Noah Miller hooked up on a slant pattern to the back of the end zone for a 10-yard touchdown, their final, and a 31-21 lead. Ben Wenning picks up valuable yards and the first down to extend the Cavaliers’ final, and winning drive. But no lead was safe around Brendan Lamb, and with time enough for one remaining drive Massie again drove the ball the length of the field, 74 yards, and Lamb scored his third touchdown of the night from six yards out to cut the lead to 31-28. But that was as close at it got as Coldwater milked the final minute on the clock and sent those that braved five hours and ten minutes of football and protocol foolishness home…at 12:35 AM! Dan McSurley gave credit where credit was due. But in reality, Chip Otten and his staff out-coached Massie, willing to put the game in the hands of those previously unfamiliar with a challenge so big. And later, the coach spoke with pride over the manner in his his revamped Cavaliers had quieted the doubters (at least for a week), and how so many first-timers had competed against what’s obviously one of the state’s best football teams. Junior Jake Hemmelgarn completed 17 of 24 passing attempts for 252 yards and three touchdowns against Division IV runners-up Clinton-Massie. And really proud of the manner in which a first-time quarterback, under that kind of pressure, could make the deep passes, the touch passes, and account for, by night’s end, 357 yards and 31 points. “He was unbelievable,” gushed Otten. “His awareness was so good on blitzes. He knew what to do with the ball, he knew when to scramble, and he was able to make those touch passes off the scramble. So I’m proud of Jake, all 145 pounds of him. He’s slippery, and he’s faster than anyone suspects, and his accuracy throwing the ball is just like Jack’s was (his older brother). It was, for those who stayed…special. A Friday night special that will no doubt stun many around the area and the state when they wake up Saturday and read the score. 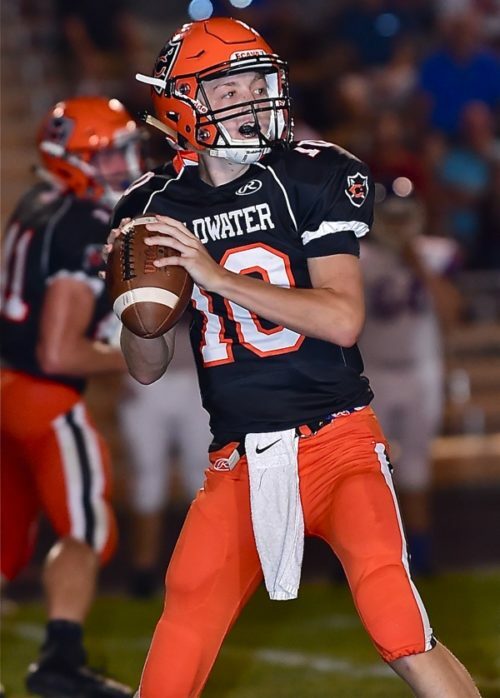 Stunned, to consider that this same Coldwater team was considered in rebuild mode after consecutive years of massive graduation losses, and all that talent gone – Brody Hoying, Jack Hemmelgarn, Harlamert, Post, Schoenherr, and Bettinger. 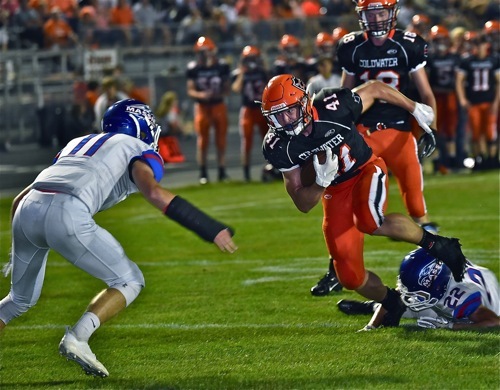 But they find a way – they always find a way – and from Friday’s win a new confidence with which to go forward, as Versailles (next week), Minster and then Fort Recovery must now consider the impact of how they beat Clinton-Massie.